The new G2 Research Telos comes in 9mm and .38 Spl. +P ammunition. One of the strongest movements in improved ammunition design and performance over the last 10 years has been with the 9mm cartridge. 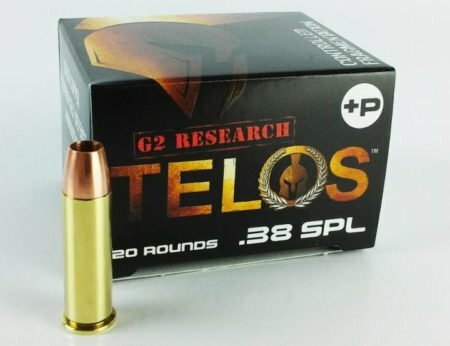 G2 Research looks to take advantage of the resurgence in the 9mm cartridge with their new Telos +P ammunition. At the same time, the company looks to spur the same kind of movement on the revolver side with their .38 Special +P ammunition. The Telos bullet is CNC manufactured using a pure copper slug. This is a very important improvement in traditional bullet designs that simply placed a copper jacket over a lead bullet. The Telos is designed with a huge internally segmented hollow-point. Though the outward face of the bullet appears to be solid, the inside is CNC machined with purpose-built segmentation grooves. When the Telos hollow point fills with fluid the expanding pressure causes the Telos to literally fly apart in a controlled-fragmentation releasing six-copper petals. This type of fragmentation creates (7) wound channels rather than the one wound channel created by traditional ammunition. These fragments spread inside the target for several inches increasing pain, blood loss, and injury. Ultimately these wounds lower the suspect’s blood pressure that is necessary to remain conscious and capable of aggressive action. The base of the bullet continues to travel forward for additional penetration. Testing has shown 10+ inches of penetration by the Telos bullet. This level of penetration is purpose designed so the Telos bullet stays inside the target to release all of its energy. This will greatly reduce the potential for pass-through impacts that could injure an innocent bystander on the other side of the target, or damage property. For may years the Federal Bureau of Investigation (FBI) has conducted testing on various handgun cartridges to evaluate their performance in real-life scenarios. The FBI developed a standardized testing procedure using ballistic gelatin, light and heavy clothing, drywall, plywood, and vehicle glass. The FBI evaluated penetration, expansion, and performance across the testing criteria. Standards of penetration for approved duty ammunition require 12-18 inches of penetration. The G2 Research Telos appears not to meet that standard, though its (7) wound channels have a huge potential to stop a deadly threat by greatly increasing the injury potential. Though this standardized testing and evaluation is still generally good, it has been the same standard for dozens of years. As designed, the FBI penetration standards are intended to ensure the bullet has enough energy for self-defense ammunition. However, if the true intent of the penetration test is to determine the effectiveness of the round upon impact with a human target, then the current FBI protocol may not be properly considering the advancements in bullet technology. In recent years there as been an incredible growth in metallurgy, bullet design, powder efficiency, and overall cartridge performance over a wide range of calibers. Modern handgun ammunition accepts the limitations inherent in pistol ammunition, but advances the concept of creating enough injury to stop a deadly threat. In that regard, there are several modern cartridges that can perform very well, but fall outside of some of the FBI Standards. The penetration performance of the projectile, throughout the series of six tests is 12-18″ of uniform penetration, high bullet weight retention and 1.5 times caliber expansion. Average accuracy from test barrel and service weapon – shots are at a distance of 10 feet from the muzzle to the front face of the gelatin block. Test 1 — Bare gelatin. Test 2 — Heavy clothing. Gelatin block is covered with four layers of clothing. Test 3 — Steel. Two pieces of 20-gauge, hot-rolled steel with a galvanized finish. This test simulates the weakest part of a car door. Test 4 — Wallboard. Two pieces of ½-inch standard gypsum board are set 3.5 inches apart. Gelatin block is placed 18 inches behind the rearmost piece of gypsum to simulate a typical building interior wall. Test 5 — Plywood. One piece of ¾-inch “AA” fir plywood is set 18 inches in front of the gelatin block. This simulates the resistance of a typical wooden door or construction timbers. Test 6 — Auto glass. One piece of A.S.I. ¼-inch laminated automobile safety glass set at an angle of 45 degrees to the horizontal and 15 degrees to the side, resulting in a compound angle. 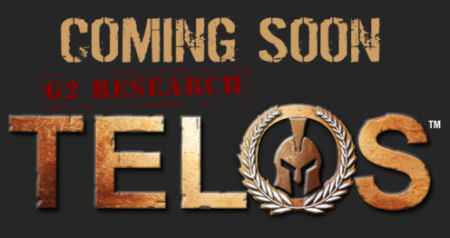 Telos Ammunition will be available soon. Many of the concerns over these two cartridges over the decades has been centered on their general underrated performance for self-defense situations. Though both rounds had been used successfully in military conflicts and law enforcement, each round has suffered favorability in law enforcement circles due to a perception of under performance. Law enforcement officers are charged with the protection of their community. 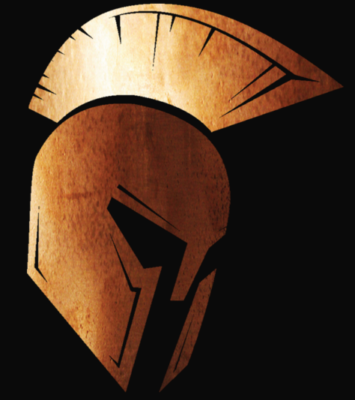 The selection of duty ammunition is a very serious concern for any Chief Executive. In addition to protecting the community, the individual officer must be confident in their duty ammunition protecting them as well. Under performing ammunition creates the risk that an officer will go down, and then the community is open to harm from the dangerous suspect. In addition, poor performing ammunition may over-penetrate and strike unintended targets. The G2 Research Telos ammunition appears to be a well designed and purpose-built cartridge. Both cartridges are lighter weight than traditional 9mm or .38 Spl. bullets, but the company increases the powder charge to +P to provide greater energy and matching velocities. Overall I see a lot of good potential from the Telos line, as I have with the other G2 Research lines.